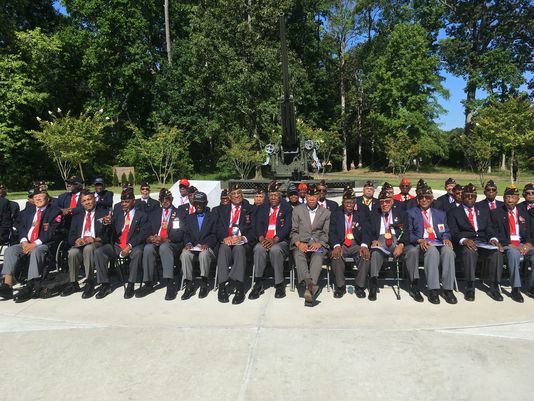 CAMP LEJEUNE, N.C — More than 1,000 people gathered here Friday morning to honor the first African-Americans admitted to a still-segregated Marine Corps during World War II. The first phase of the National Montford Point Marine Memorial was unveiled about 75 years after the first black Marines began training here to fight for their country. The crowd included dozens of original Montford Point Marines, many of whom donned Congressional Gold Medals — the highest civilian award bestowed by Congress, which were awarded in 2012. The Marines were recognized as heroes, pioneers and men who fought for the right to defend their country. Retired 1st Sgt. Barnett Person was comforted by the presence and memory of old friends as he looked upon the memorial. “This feels very, very good. It is a day I never thought I would see,” said Person, a 1946 graduate of Montford Point who proudly points out he stayed in uniform for 28 years, eight months and 10 days. He earned the Silver Star as a tanker in Vietnam during that time. Amid the celebration, his gaze repeatedly drifted to young, uniformed privates and privates first class. “I hope they continue to carry on, and follow in the footsteps, and complete the mission,” he said. Though segregated and marginalized, given menial tasks and substandard equipment, the Montford Point Marines charged forward — a fight captured in the memorial’s various components and explained by retired Gunnery. Sgt. Forest Spencer, national president of the Montford Point Marine Association. The 900-pound bronze statue and its base stand 15 feet tall. Behind the Marine sits a rare 90mm M1A1 anti-aircraft gun, the primary weapon used by the 51st and 52nd Defense Battalions to which the Marines were assigned. The bronze Marine is seen setting down his ammunition can and taking up his rifle, a symbolic nod to the transition from a support role to one of combat. The memorial includes three rings that meet in the center and a “wall of stars” that represents the 20,000 Marines who trained at the segregated Montford Point recruit camp during the 1940s. In the words of Spencer, they arrived, they served, they lived and they endured. The $1.8 million memorial, now in its seventh year, is being constructed in two phases on what many in attendance consider hallowed ground. It stands at the entrance to what was once known as Montford Point, but in 1974, was renamed Camp Johnson in honor of Sgt. Maj. Gilbert “Hashmark” Johnson, a Montford Point drill instructor. “Today, this inspiring memorial takes its rightful place among the other silent testimonials to the courage, dedication and sacrifice of our men and women who have worn the cloth of this nation,” said Brig. Gen. Thomas Weidley, commander of Marine Corps Installations-East. “The story of the Montford Point Marines in the 1940s is a uniquely American one — forged by ominous threats from abroad, and shaped by societal struggles and entrenched racial bigotry at home. Executive Order 8802, signed by President Franklin D. Roosevelt on June 25, 1941, prohibited racial discrimination in the military, but the Marine Corps was not quick to embrace the change. In the eight years that followed, black Marine recruits were forced to train at Montford Point. More than 12,000 served in the Pacific Island Hopping Campaign. Executive Order 9981, signed by President Harry S. Truman on July 26, 1948, ended segregation in the military. CVO has a new meeting day and time: We’re meeting on Wednesday, August 17th from 7 to 9 PM at the Jesse Brown VA in the 2nd floor Conference Room. As usual, parking will be validated. The agenda will include a CVO history by Bruce Parry, former CVO Chair and a thorough discussion of the future of CVO: New People, New Energy, A New Way Forward! As always, coffee and donuts will be served, even though it’s at night. Make sure you attend this important, CVO-changing meeting! 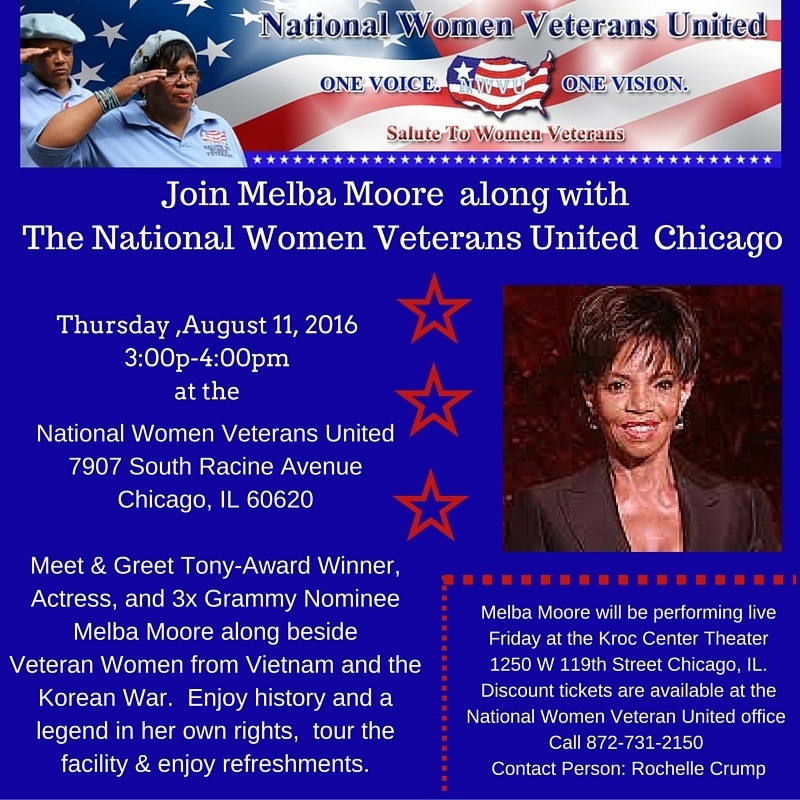 National Women Veterans United will have two special events with Melba Moore. 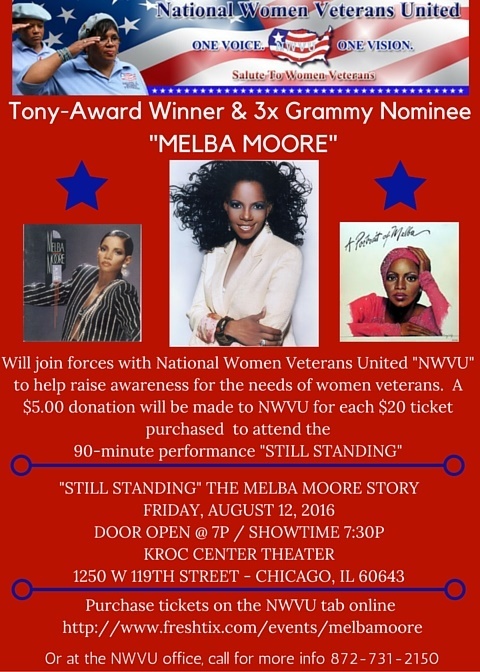 Tell your friends and family to come out and support the National Women Veterans United (NWVU) Fundraiser and participate in the Meet and Greet. Please see flyers below. For more information call 872-731-2150. The 2016 Mental Health Summit is a full-day event focused on the causes and prevention of Veteran suicide, to include keynote speakers, a Veterans’ panel, networking events, and breakout groups on various related topics. The next meeting of CVO will be on this Saturday, July 16th from 10 AM to 12:30 PM at Jesse Brown VA Medical Center in the Conference Room on the 2nd Floor. We will discuss the current state of the VA and veterans affairs. As always, coffee and donuts will be served and parking will be validated.